Largest flying dinosaur: Four wings on Changyuraptor kept it from crash landing. Changyuraptor yangi was about 4 feet long from tip to tail. In the dinosaur world, raptors have a reputation for being ferocious, fast, and having sharp claws to slash open their prey. A new fossil unearthed in China confirms that some raptors could not only rip your face off—they could also fly. The new species, called Changyuraptor yangi, is the largest known flying dinosaur. It was named for its hallmark feature: long feathers (chang yu), which grew on its tail and legs. Changyuraptors and other dinos from their family of raptors are often called “four-winged” dinosaurs because their long feathers make their legs look like a second pair of wings. Part of the reason scientists were able to make such detailed observations of this fossil has to do with where it came from. This fossil was found in the Jehol Biota, an incredibly rich source of fossils in the Liaoning Province of northeast China. Hundreds of exceptionally well-preserved fossils have been found in this area, due in part to the conditions of its ancient environment. When Changyuraptor lived—120 million years ago, during the early Cretaceous period—the area was densely forested, with small lakes and streams and many active volcanoes. Volcanic ash buried animal corpses on land and in water; some were even buried in sudden, Pompeii-like eruptions. Lakes in the area had very little oxygen, which meant specimens were not scavenged by other animals, and were less prone to decomposition by bacteria. This preserved delicate soft tissues like feathers, skin, muscle, and guts. Despite the exceptional preservation of this specimen, it wasn’t perfect; Chiappe said that in the fossil they studied, the Changyuraptor’s legs overlapped. Chiappe and his team believe these “hindwings” were useful in flight, but its not yet clear how useful. 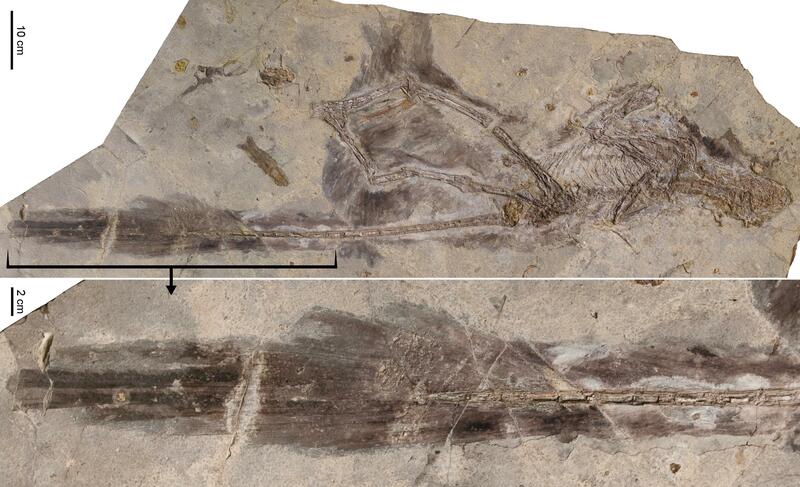 The exquisite 120-million-year-old fossil shows feathers on the wings and legs.